Looking into a photographers bag, is a bit like looking through someones underwear draw… you’re never quite sure what you might find. 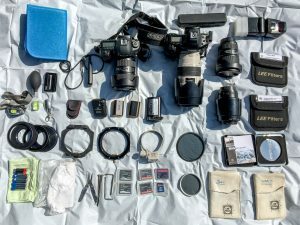 How people organise their gear and what they bring along on a photo shoot is a very personal thing and in my bag, apart from the obvious, I have various little gadgets that can make life easier or get me out of a spot. I have this set up for holding two camera bodies, but this can be changed however you want as all the velcro attached dividers can be removed and set up in a way that suits your kit. How we arrange our bag is a very personal thing, of course. There is no right way. But I would encourage people to think about it logically, and put things in a place where they are easy to find. Many times I’ve looked into a photographers bag and wondered how they manage to find anything! Often the success or failure of a shoot will come down to a matter of moments. Our battery might run out, we might need to change a filter as the lighting changes or a lens for a different composition. Having a well organised bag will enable you to keep concentrated on the task in hand, rather than taking five minutes to find a filter ring, by which time the light has gone. For me it’s all about giving myself the best chance I can to get the shot. It can be difficult enough without putting more obstacles in the way. 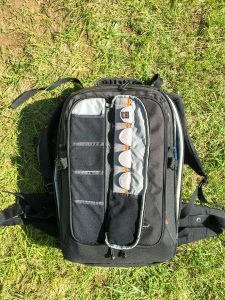 The bag in the picture is the the Lowepro Vertex 300. This is the largest in the range, the smaller ones being the 200 & 100. The 300 fits the usual cabin size requirements but depending on what you put in it, can easily exceed the normal 10kg allowance when fully loaded. Typically I’m hitting about 12kg fully loaded including my Mac Book Pro, for which it has a separate 17 » compartment. So when travelling by plane, I often have to put some equipment (not fragile stuff) in my luggage which goes in the hold. It’s a beast of a bag that I absolutely love. 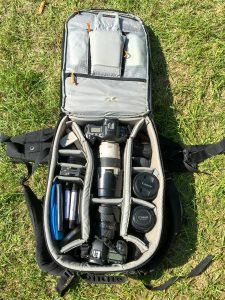 I really like the way it folds out which gives easy access to all my gear. Nothings worse than fumbling around in dark pockets at 4am, trying to find a piece of equipment. It’s also incredibly solid and well made. After ten years of heavy use, it’s not missing a stitch. I also have a smaller Lowepro Mini Trekker, for when I don’t need all my gear to hand. The back of the bag has many compartments for memory cards batteries etc, also quite useful for snacks to keep you going throughout the day! It does seem amazing when you get it all out, how much stuff fits into that bag! And here’s the list of what all that stuff actually is. Both with L Brackets attached. It’s quite interesting to see how much of my bag is filled with various filters and their attachments. But that’s how important they are to me. As I’ve shown in a previous post the huge difference that filters can make and are my preferred route for capturing the full dynamic range in an image. I will use HDR if needed but the results can be a bit hit and miss. On the right hand side of the image from top to bottom. The difference between hard and soft is just that the line between clear and dark is more graduated. In reality, I seldom use the soft and prefer the hard in most situations. Heliopan Polariser (this large filter works with the Lee system so I can use it in conjunction with my other Lee filters. Two Lee Filters Holders and various Adapter Rings to fit my lenses and popular sizes for my workshop guests. Memory Cards You can never have enough. Get the fastest write speed you can. When shooting with the 5DsR I’m producing 50 Mega Pixel Raw Files, that’s a lot of information to process. My latest cards are the 32 Gig Sandisk Extreme Pro 160 MB per second. That gets the job done. Various spare general purpose batteries. It might seem a bit of overkill all this gear, but believe me, during an intense shooting period, I’ll usually need it all at some point. On a photo trip I will always take my Mini Trekker along, and often transfer the equipment I need for a specific shoot into that, making a long walk a bit easier. Generally, I think you can never be over prepared. It is quite easy however, to be underprepared. Any questions or comments? Just drop me a line via the contact page.